Brett received his Bachelors degree in Exercise Physiology in 1993 and earned his certification as a Strength and Conditioning Specialist in 1997. Brett served as the Strength and Conditioning Coordinator at Rehab 3 Center for Athletes for 8 years, and was the Assistant Strength Coach at UNH from 1998-2000. In addition, Brett has served as the New Hampshire State Director for the National Strength and Conditioning Association. Brett started the strength and conditioning movement in the Seacoast in 1997 with a group of 12 baseball players from Spaulding High School. As the popularity of his programs grew, Brett saw a unique opportunity to expand his ideas into a new business venture. In March of 2003, Brett opened Elite Sports Performance in Portsmouth, starting the only facility in the region with a primary focus of helping athletes reach their goals. With over 12 years of experience, Brett has helped thousands of middle school, high school, college, professional, and adult athletes recognize their potential and progress to their next level of performance. In January of 2009 Brett saw an opportunity to expand Elite Sports Performance to two locations. Elite can now offer their clients over 70,000 sq/ft of space. Carter received his Bachelors degree in Kinesiology with a concentration in Athletic Training from the University of New Hampshire in 1998. He earned his certification as a Strength and Conditioning Specialist in 2003. While at UNH, Carter worked extensively with the football, hockey and gymnastics programs providing preventative medicine, health advice, and return to play rehabilitation programs. Carter was employed by Rehab 3 Center for Athletes from 1999 to 2006. While at Rehab 3 he worked with several local high schools, treated thousands of physical therapy patients, and developed strength and conditioning programs. 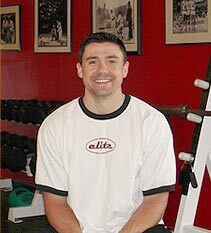 In May of 2006 Carter brought his 7 years of athletic training and strength and conditioning experience to Elite Sports Performance where he continues to help a wide range of athletes reach their potential. "What is most gratifying to us is to take a middle school aged student and watch them progress through high school and see how much we’ve helped them prepare for college." "Here at Elite I enjoy watching great athletes do things that are truly amazing, but it's also so rewarding to see an athlete of lesser skill become the athlete that they work so hard to be. By working with a wide range of athletes, it makes me love my job more and more everyday."